The St. Regis mission was started because many Mohawks were forced to move out of the Mohawk Valley in New York by European settlers, and the Mohawk mission at Kanawake began to be overcrowded (Saint Regis Mohawk Website). On June 16, 1755, Kanawake Mohawks and their French Jesuit priests, Father Antoine Gordon and Father Pierre-Robert-Jean-Baptiste Billiard, relocated to the area that is now home to the St. Regis Indian Reservation (Bonaparte). Formally a central site for fishing and hunting due to the many small rivers that converge there, the location was know by the Mohawks as “Akwesasne” which means ““Land Where the Partridge Drums,” (Saint Regis Mohawk Website). There, the St. Regis Church was built using logs which they covered covered with bark (Bonaparte). Once a local saw mill was purchased by the priests for the community, the church was rebuilt with hewn logs. However, in the early 1760s, the church burnt down. 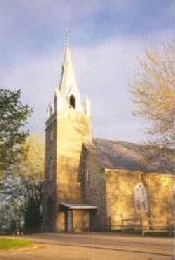 The stone church that still remains today was constructed between 1792 and 1795. Once the Mohawks received approval from their new missionary, Father Roderick McDonnell, Mohawk men, as well as women and children, participated in the construction, using funds they had raised among themselves. It has only changed slightly in the years since, and this was in repairs that were needed due to floods, fires and earthquakes. In the years after construction, many priests came and went. In 1895, Father J. P. Bourget took over and remained the pastor of St. Regis for 42 years, so he would have been there when Joseph F. Tarbell lived in nearby Hogansburg (Bonaparte). The priests were like chiefs to the Mohawk people, who were devout practicers of Catholicism. Being a member of the Catholic Church, Tarbell would have most definitely been exposed to Christianity and its teachings and practices. Therefore, when he went to the Carlisle Indian School it probably wasn’t as much of a culture shock for him as it was for some Native American children. 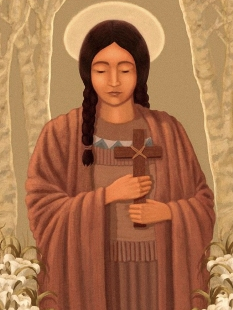 Kateri Tekakwitha was a young Mohawk woman who embraced Christianity and devoted her short life to charity and chastity. Kateri, the Iroquois form of Catherine, was beatified by Pope John Paul II on June 22, 1980 (Koppedrayer 277). Then, on October 21, 2012, she was canonized as a saint by the Roman Catholic Church (Saint Regis Mohawk Website). When Kateri was four years-old, a smallpox breakout killed her parents and only sibling. Although she survived, the disease left her face scarred and her vision permanently damaged (Koppedrayer 282). She was left to live with her uncle who was chief of the village (283). When Kateri hit puberty, her family tried to arrange for her marriage. Through her desire to remain “pure,” she avoided marriage and resisted all male advancements, even if they turned violent (283). One day, due to injuring her foot, she had the chance to talk to a missionary, Father Lamberville, who spoke to her about Christianity, and Kateri immediately began to frequent his catechisms at the chapel (284). To the disdain of the community, she was soon baptized. She was ridiculed and even accused of sorcery (285). At one point, someone even threatened her life. She was encouraged by the priest and travelers passing through her village to travel north to a mission in what is now Kanawake, Quebec, because the chief their had embraced Christianity and many converts lived there (285). Because her uncle violently opposed Christianity and her moving, she waited until he left to meet with the Dutch, then escaped with two people who had come down from the mission. Her uncle gave chase, but ultimately she was able to elude him and make it safely to Kanawake (286). At the mission, she continued to practice charity and chastity, even physically harming herself as acts of penance. However, she only lived in the mission for two years because her poor health finally failed her in 1680, and she passed at the young age of 24 (287). Kateri is attributed with many miracles, and the Mohawk people pray to her oftern. This story, which is recounted in the diaries of Jesuit missionaries, is strikingly similar to the one that Joseph Tarbell writes in The Indian Craftsman. It is interesting to see how the story has been embellished over time, as it was handed down to Joe through Mohawk oral tradition. This entry was posted in Joe F. Tarbell, The Conflicted and tagged Akwesasne, Christianity, Iroquois, missionary, Mohawk Culture, Saint Kateri Tekakwitha, St. Regis Reservation. Bookmark the permalink.